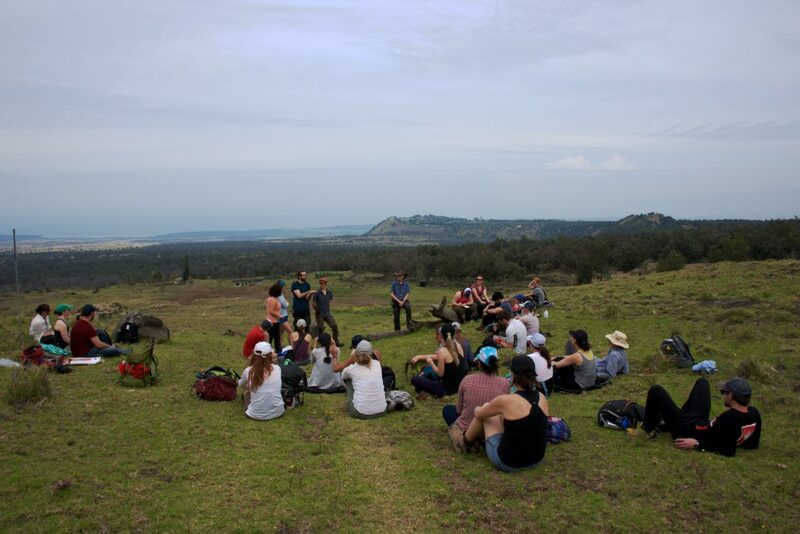 Each year, MAGNET organizes an annual workshop, a week-long program aimed at equipping trainees with technical and professional skills, facilitating interactive learning and exciting fieldwork, and encouraging friendships and collaboration within the network. This being MAGNET’s last year, we set out to end on a “HI” note. Our grand finale workshop was held on the Big Island of Hawaii during Reading Break from February 17-23, 2018. The workshop brought together 32 members of the network from across Canada: 22 current trainees, 4 program alumni, 4 professors (Ian Clark – Ottawa, James Scoates – UBC, John Stix – McGill, and Dominique Weis – UBC), 1 program committee member (Brett Gilley – UBC), and the acting program coordinator (Kimberly Low – UBC). 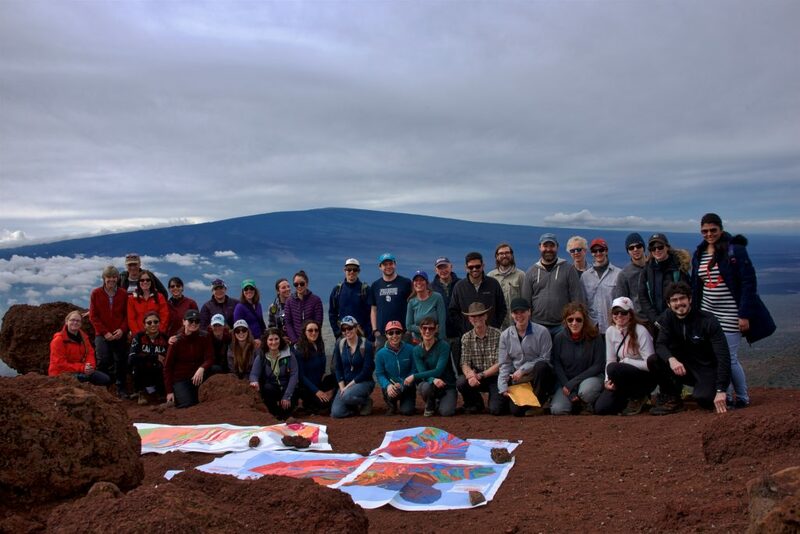 The group was also joined by two local scientists in Hawaiian geochemistry, Dr. Mike Garcia of the University of Hawaii at Manoa, and Dr. Frank Trusdell of the Hawaiian Volcano Observatory (HVO). 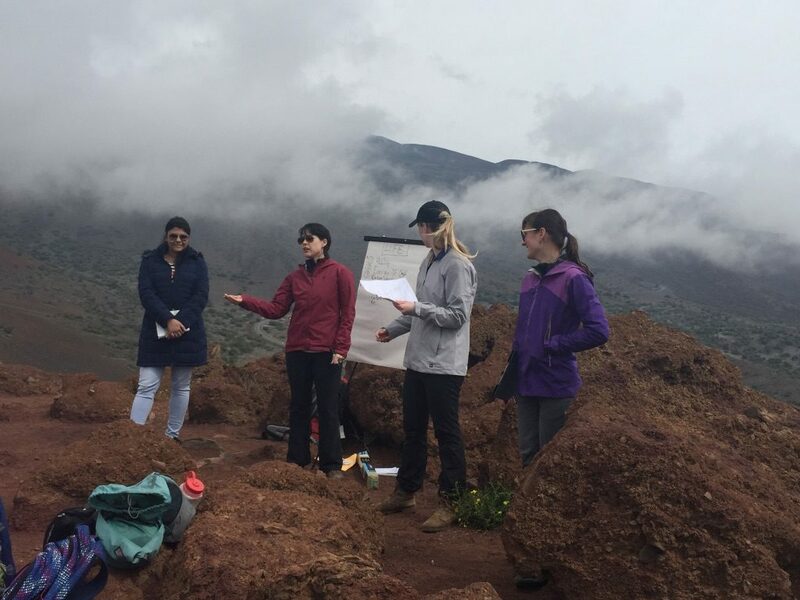 The primary aim of the workshop was to investigate key geochemical problems relevant to Hawaii from mauka (mountains) to makai (the sea), spending as much time as possible in the field and making use of the Big Island’s diverse landscapes and geologic features. 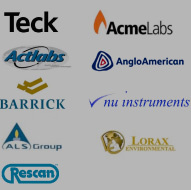 Through our field activities, we set out to employ, test, and evaluate analytical techniques in the field, with a focus on emerging geochemical applications for the Earth and environmental system. 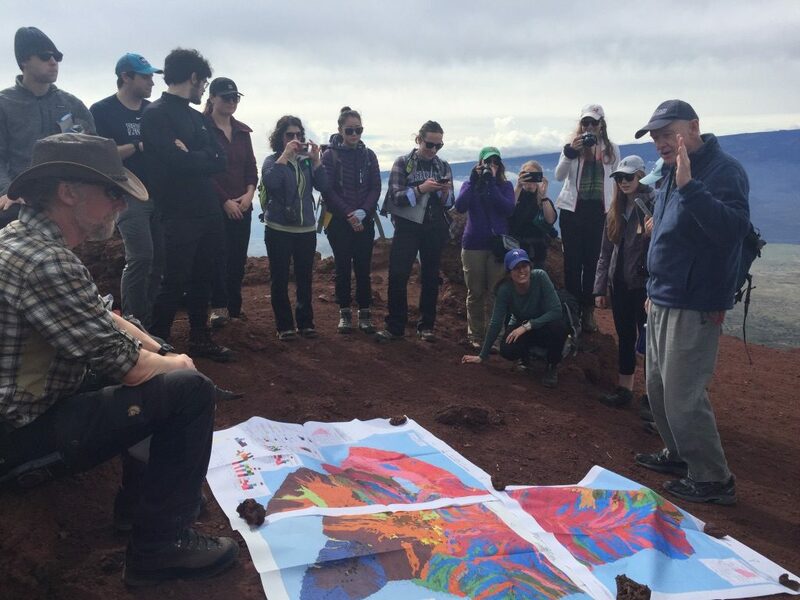 In addition to being a tropical, volcanic island with a recent geologic history, Hawaii is a prime location for a MAGNET workshop as several trainees have studied/are studying Hawaiian lavas, volcanic gases, and soils, and MAGNET Director, Dominique Weis, has done extensive research on the Hawaiian mantle plume. The workshop was organized by a committee from the University of British Columbia, composed of MAGNET Professor, James Scoates, MAGNET postdoctoral trainees, Laura Bilenker, Elizabeth King, and Miling Li, and acting MAGNET Program Coordinator, Kimberly Low. 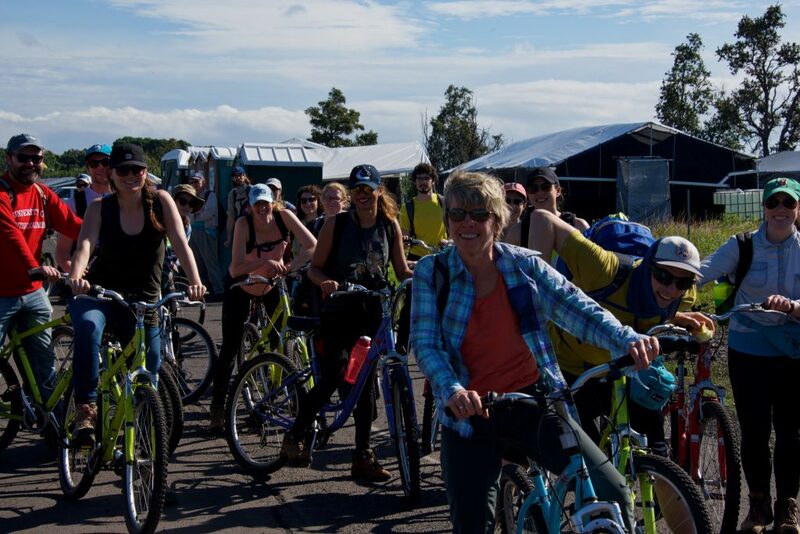 Similar to the 2015 MAGNET Workshop in Yellowstone, groups of trainees were responsible for planning, organizing, and running the field activities; however, the organization and structure was more free-form this time. 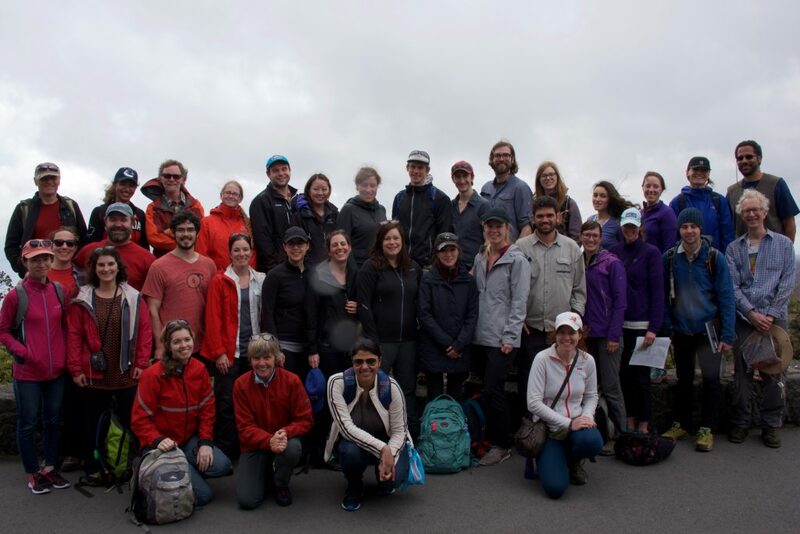 The groups of trainees worked together with the other students at their institutions to identify interesting geochemical questions on the island, and created six exciting field exercises. The field activity topics included: 1. Hawaii as a Mars and Moon Analogue Site (University of Toronto), 2. Geothermal Energy on Hawaii (UBC 1), 3. Volcanic Gas Geochemistry as a Volcano Monitoring Tool (McGill/UQAC), 4. The Geochemistry of Hawaiian Lavas and Tracing Travel, Migration, and Trade Among Ancient Polynesians (UBC 2), 5. Volcanic Soils (UBC 3), and 6. Aquatic Geochemistry (University of Ottawa). 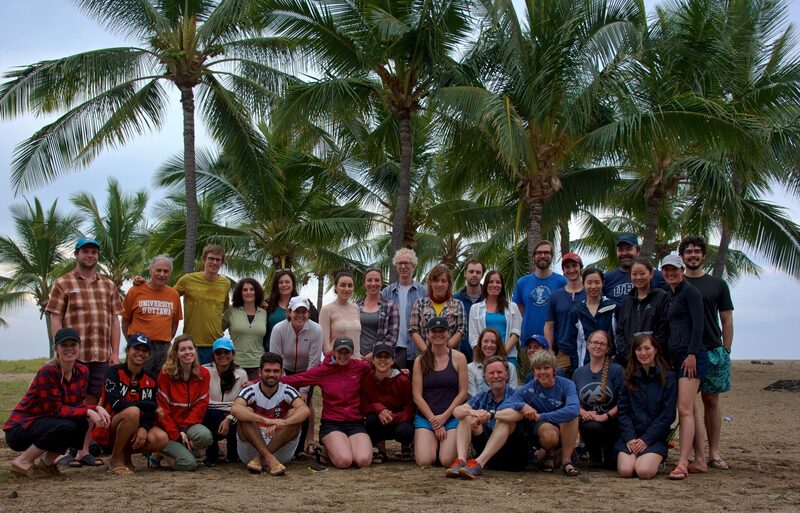 In order to experience as much of the Big Island as possible, our group was based out of two cities. We began the workshop in Hilo (on the wet, east-side of the island), close to Mauna Kea and Hawaii Volcanoes National Park, and then relocated to Kona (on the dry, west-side) for the remainder, in proximity to the Kohala Coast. On February 16th and 17th, workshop participants arrived in Hawaii, flying in from Vancouver, Toronto, Ottawa, Montreal, and Chicoutimi. The workshop officially began in Hilo, with an evening kickoff event that featured a fun ice breaker activity (“MAGNET Hawaii Bingo”) and a video message from MAGNET Program Coordinator, Diane Hanano, who is currently on leave. 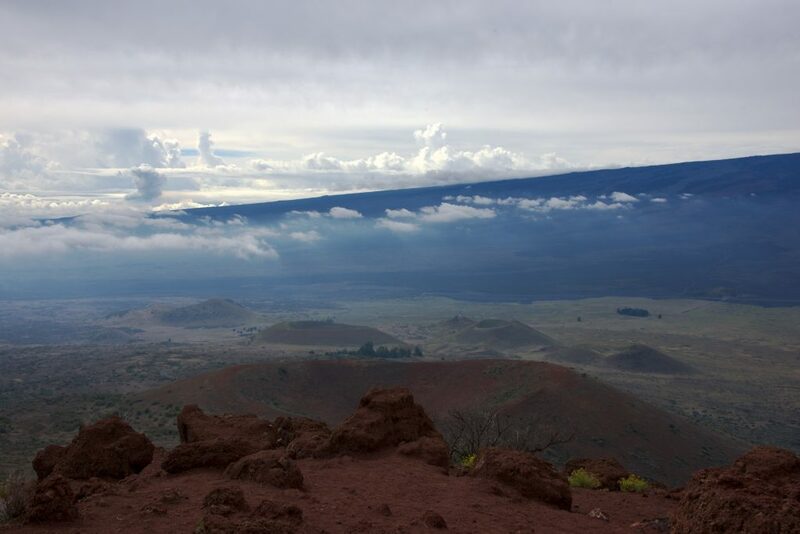 On Sunday, February 18th, the first official day of field activities, we headed to Mauna Kea, a dormant volcano and the highest point in the state of Hawaii. Although mostly underwater, when measured from its oceanic base, it is the tallest mountain on Earth. Upon our arrival at the Mauna Kea Visitor Information Station (2,800 m. elevation), we immediately noticed the distinctly un-tropical temperatures, an effect of the high altitude. However, everyone was well-prepared with warm layers and jackets (i.e., light Canadian winter-wear). 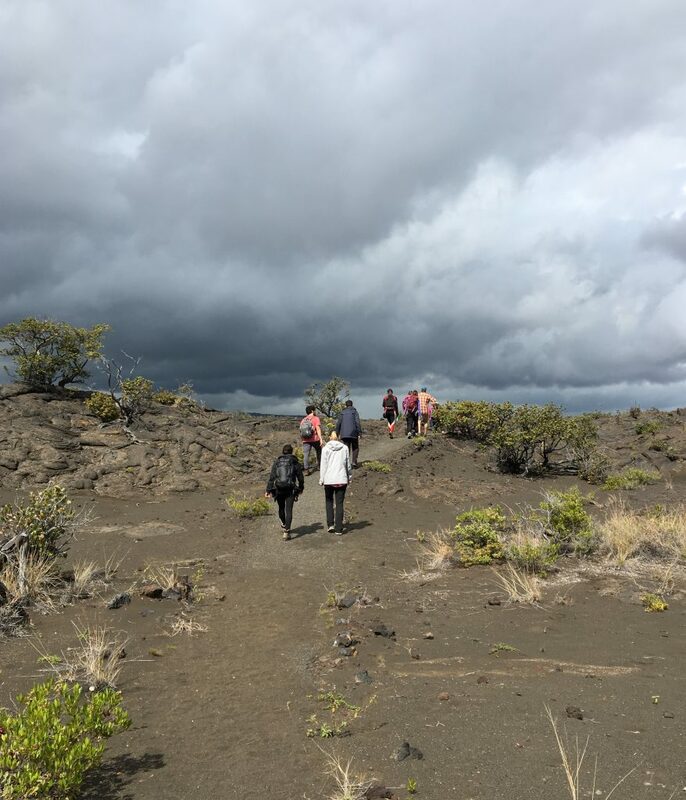 Led by Dr. Mike Garcia, we hiked a short distance uphill to an outlook with a breathtaking panorama of Mauna Loa and the surrounding landscape. This was our Plan B location (significant snowfall on Mauna Kea prevented us from reaching the summit), but it worked beautifully! With Mauna Loa as a backdrop, Dr. Garcia provided an overview of Hawaii’s five volcanoes: Kohala, Mauna Kea, Hualalai, Mauna Loa, and Kilauea. This was followed by our first field activity: Hawaii as a Mars and Moon analogue site. The University of Toronto group presented a history of Mars rover missions and an overview of the geochemical techniques used on these missions. Teams were then tasked with designing their own rovers for the 2028 Mars Mission, with the goal of determining the potential for life on Mars. Surrounded by Martian-esque regolith, it was easy to get in the mindset of a Mars geoscientist. Teams had fun presenting their well-reasoned and creative rovers, which were equipped with a variety of instruments to detect potential biogeochemical signatures and explore (sub)surface geology and mineralogy. This was a wonderful start to the field activities and a great way to learn about analogue sites and the history of Mars rover missions. On Monday, February 19th, we drove south to Kalapana to view the active 61g lava flows of Kilauea, the world’s most active volcano. 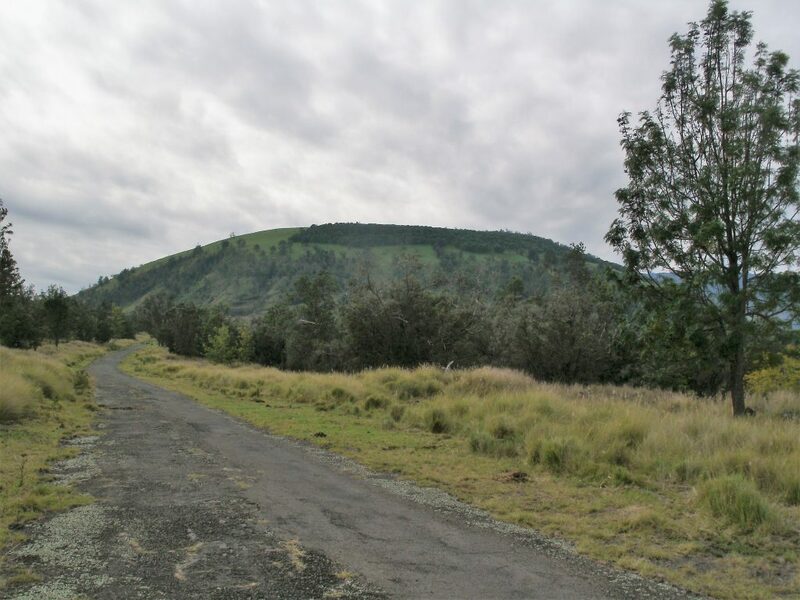 The journey began with a 20-minute bike ride along the gravel access road to reach the Kilauea lava field, a vast expanse of black basalt. Drs. 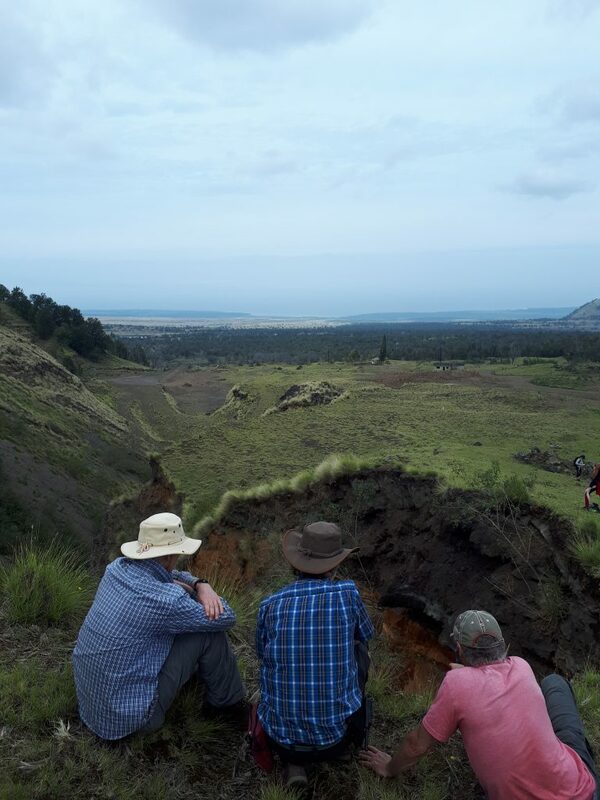 Mike Garcia and Frank Trusdell provided a brief introduction to the area and summary of recent eruptions before we set out on the hike, dressed in long pants and gloves for protection from the sharp volcanic rock. Led by Dr. Trusdell, we carefully made our way on foot to the active lava breakouts, across smooth and ropey pahoehoe and sharp aa flows. It was a long and challenging hike, but seeing the rivers of fresh, glowing lava up close was a truly unforgettable experience and a highlight of the workshop for many. Several brave trainees even had the opportunity to sample the fresh lava, under the guidance of Dr. Garcia. 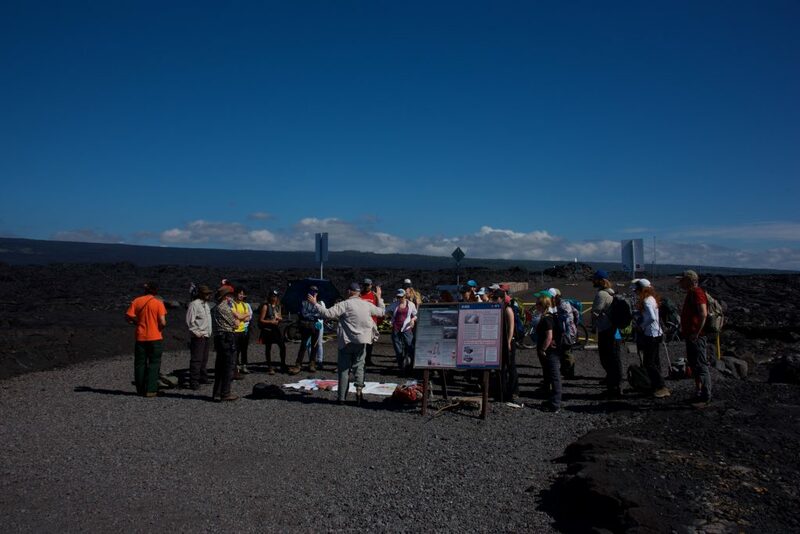 After returning from the hike, we continued our second field activity, a “jigsaw” exercise on geothermal energy, which had started that morning during the drive to Kalapana. This activity was designed by one of the UBC trainee groups to introduce geothermal energy as a renewable energy source, and to explore, apply, and appreciate both the scientific and societal considerations in developing a geothermal resource on Hawaii. Each trainee was assigned the role of geochemist, geologist, hydrogeologist, concerned citizen, or investor, and then put in a group and vehicle with trainees of the other roles. Using the provided data (e.g., geologic maps, Kilauea’s plumbing system, geothermal fluid data), the groups discussed viable geothermal resources on Hawaii, and debated whether or not to build a plant in Hawaii. 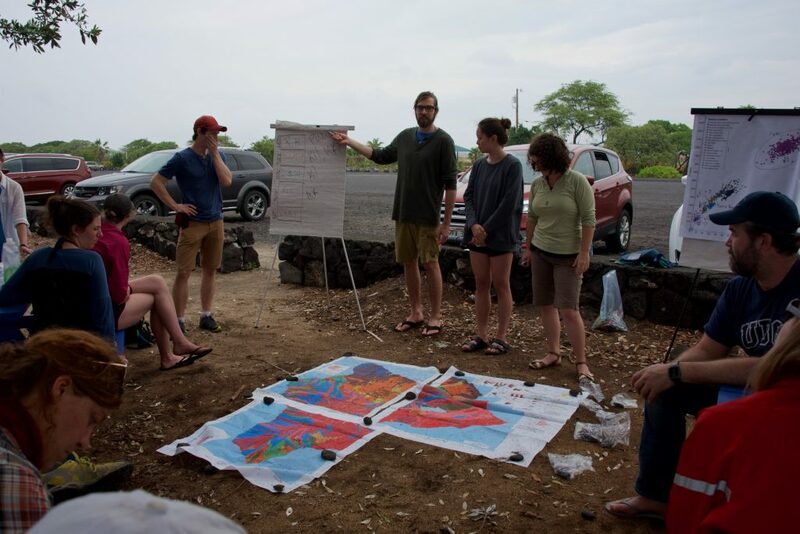 After arriving at our destination, Ahalanui County Beach Park, the organizing group facilitated the final group discussion about the pros and cons of geothermal energy sources on Hawaii. The day ended with a dip in the geothermally-heated spring, a refreshing end to a long but rewarding day. On the morning of Tuesday, February 20th, we drove to Hawaii Volcanoes National Park for our field activity on volcanic gases, Keeping an Eye on Kilauea: volcanic gases as a volcano monitoring tool. Due to unfavorable wind conditions, we could not take measurements of the volcanic gases as planned, so the McGill/UQAC organizing group adapted the activity to be more theoretical. 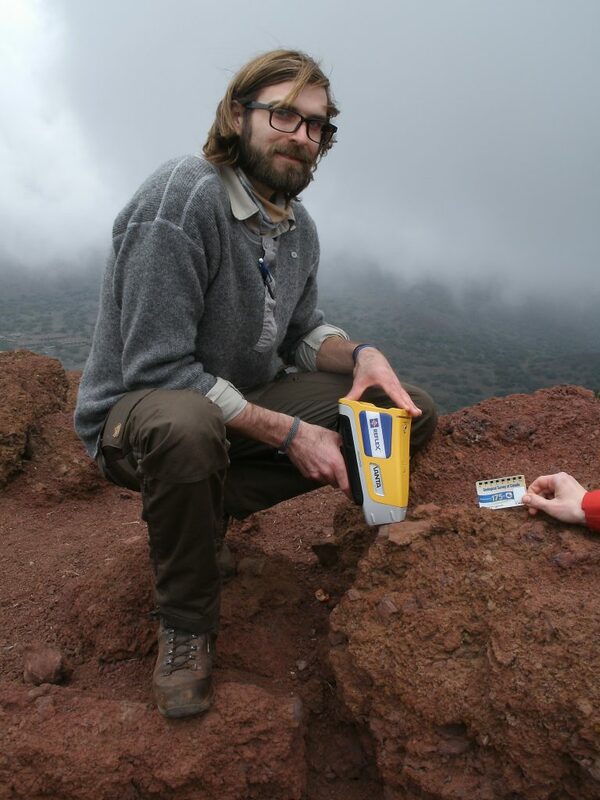 The activity began with an overview of volcanic gases and a detailed show-and-tell of two volcanic monitoring instruments, the MultiGAS and the Differential Optical Absorption Spectrometer (DOAS). The group then hiked the nearby Sulphur Banks to observe the fumaroles and steam vents and discuss the area’s expected gas composition. This was followed by a special tour of the Hawaiian Volcano Observatory (HVO), provided by Dr. Frank Trusdell, who explained the seismic, deformation, thermal, visual, and gas monitoring systems used by the HVO. After a brief lunch at the Halema’uma’u Crater outlook, where there is visible degassing from the active lava lake, and a quick visit to the Thomas A. Jaggar Museum, we hiked the Ka’u Desert Footprints Trail. The trail took us through a desert-like landscape of lava, dotted with bright red ohia trees, and featuring a fascinating set of 200-year-old fossilized human footprints. These footprints likely belonged to an ancient Hawaiian who crossed the area just after the 1790 Keonehlelei Falling Sands eruption. The activity concluded with a discussion of the difficulties of volcanic gas measurement, with expert insights offered by Dr. John Stix and Dr. Mike Garcia on the current state of Kilauea’s eruption and the potential consequences for the state’s industries and the health of its civilians. Late in the afternoon, we departed the National Park and began the long but scenic drive to Kona along the southern tip of the island. Along the way, we stopped to investigate an impressive picrite outcrop—an olivine-rich basaltic rock. During our farewell discussion with Dr. Garcia, we considered how geochemical tools and petrologic observations can be used to learn about mantle dynamics. 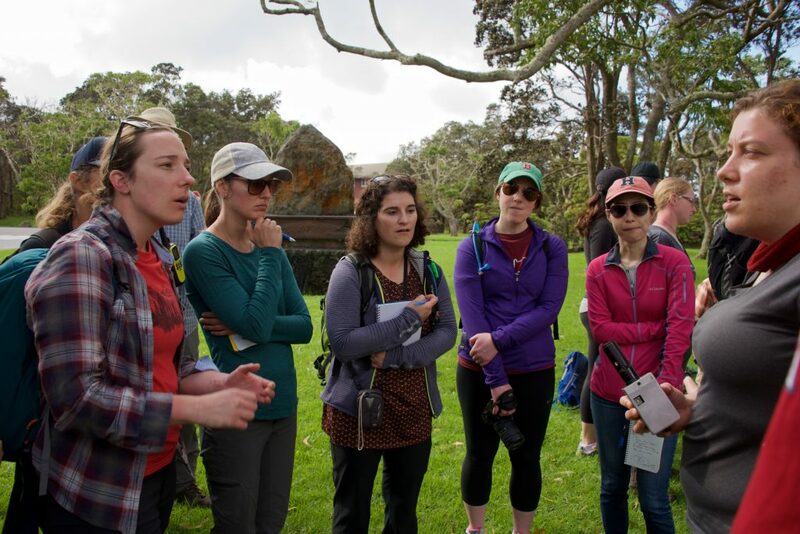 On Wednesday, February 21st, we ran our fourth field activity: the geochemistry of Hawaiian lavas: tracing travel, migration, and trade among ancient Polynesians. As indicated in the name, this exercise had an archaeological aspect, and involved applying geochemical methods to identify past human use of the landscape. We had actually started gathering data for this activity earlier in the week and continued to do so along the way during our other adventures. 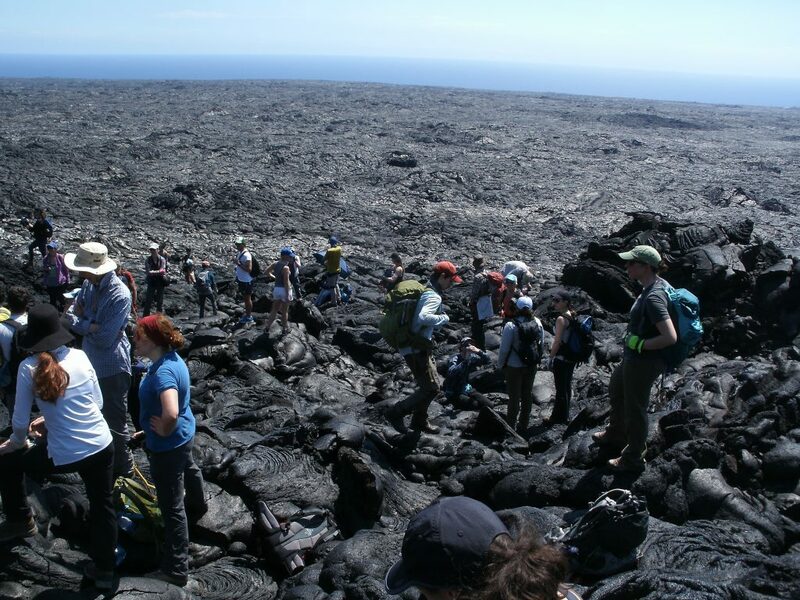 Using a special instrument called a portable X-ray fluorescence (pXRF), the UBC organizing group had obtained trace, minor, and major elemental data from lavas at Mauna Kea, Kalapana, and the other previously-visited sites. 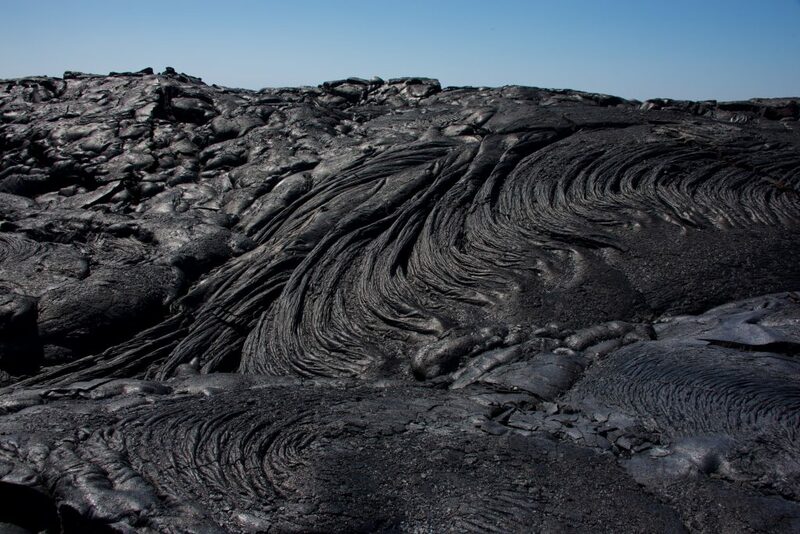 They aimed to use this data to compare the elemental compositions of the lavas, and then use the Provenance Hypothesis to place them back in their original geologic context and infer the movement of ancient Polynesians in the area. We started the day by hiking the Pu’u wa’awa’a Cinder Cone State Park, an ancient cinder cone and the only source of obsidian (a glass-like volcanic rock) in the state of Hawaii. After following the trail uphill, passing the occasional cow and goat, we reached our destination, a hill with an impressive view of the Kona coast. 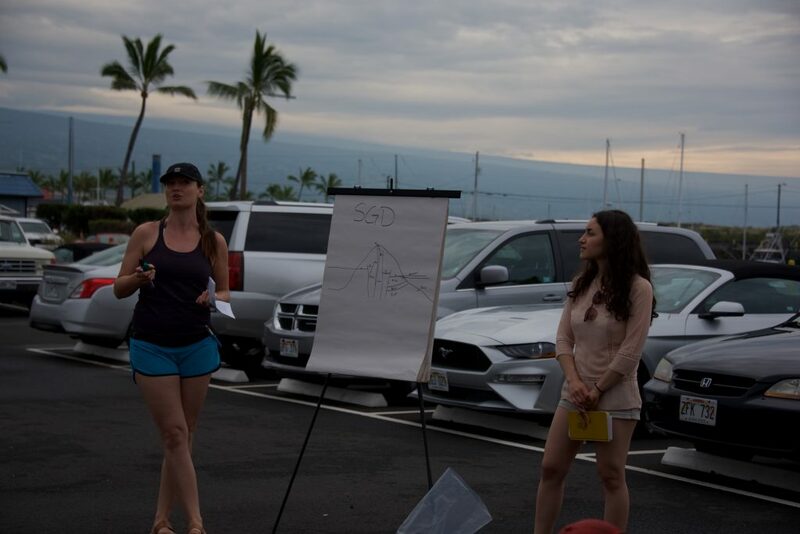 There, the activity leaders provided an overview of the area and discussed the migration of the first humans to Hawaii. In the afternoon, we went north, visiting several sites along the Kohala Coast for our field activity on volcanic soils. On the way to our first stop, trainees discussed the importance of soils to life on Earth with the others in their vehicles. 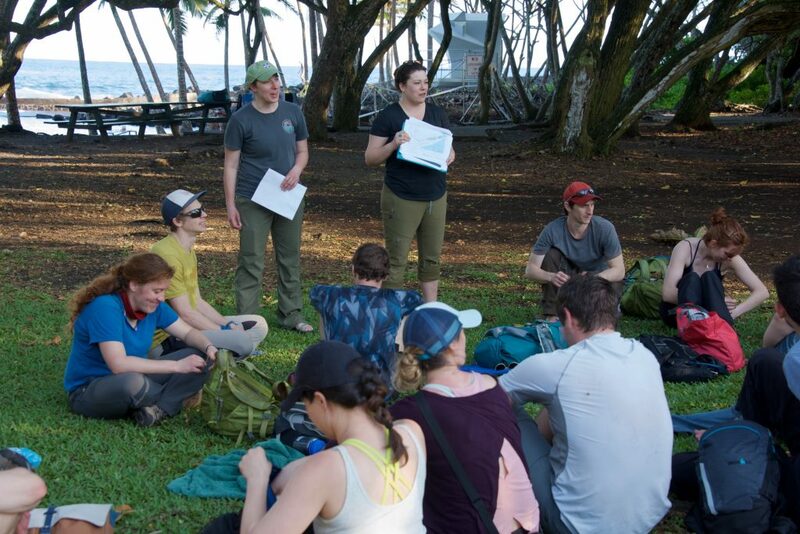 Upon arrival at our first destination, Mahukona Beach Park, an area of low precipitation, the final UBC organizing group gave a short introduction to soils on Hawaii. Not surprisingly, the majority of soil on the island is andisoil (volcanic ash), but other types such as histosoils (organic, wet soil), inceptisols (slightly developed and young soil), aridisols (desert soil), entisols (newly-formed soil), and mollisols (prairie soil) are also present. Trainees were then split into groups, and tasked with observing and completing worksheets about the soil profiles of nearby outcrops. Our second stop was further north, at an outcrop of higher precipitation. The soil profile was dramatically deeper and more developed, and effectively illustrated the differences between the profiles of low and high precipitation areas. 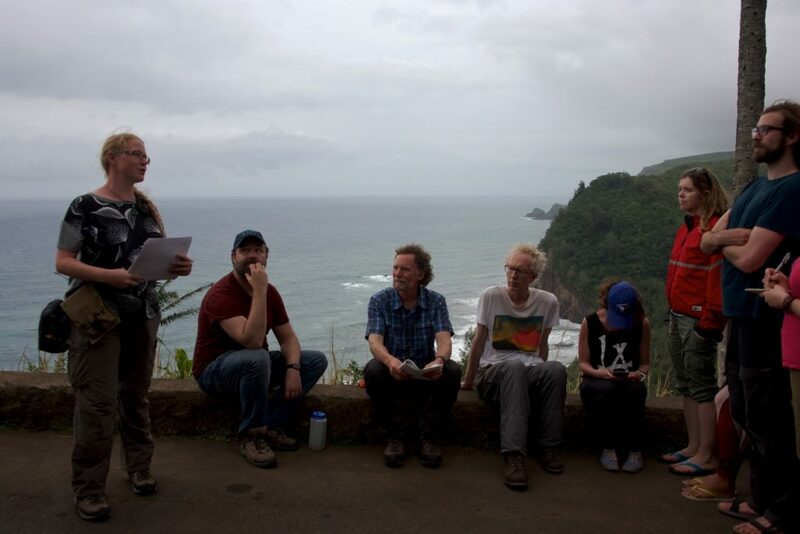 Our final stop was the Pololu Valley Outlook, where the UBC organizing group discussed how high rainfall and rates of chemical weathering led to a massive landslide that formed the Pololu Valley. Although we did not get to hike the valley as planned due to the weather, the activity was concluded in the parking lot with a fun Taboo-like synthesis game. On the long, ocean-side drive back to Kona, we were treated to a beautiful Hawaiian sunset, complete with breaching humpback whales. 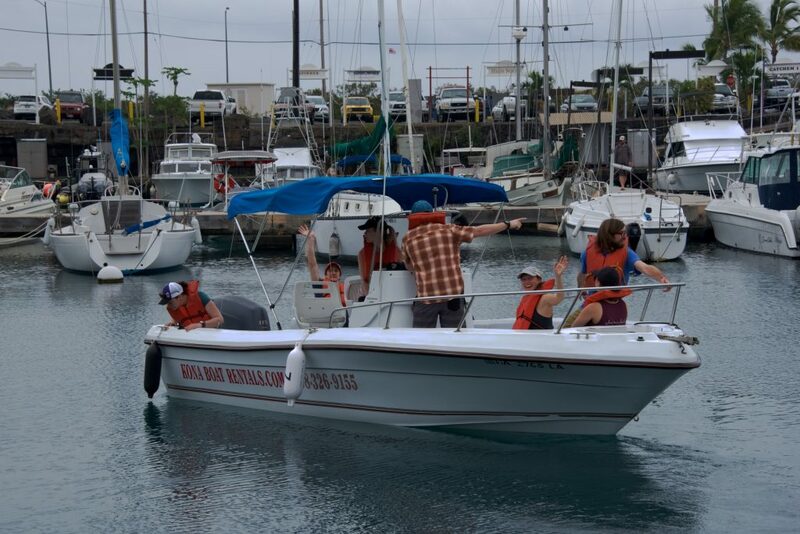 On Thursday, February 22nd, our last day of field activities, we drove to Honokohau Harbor and Kaloko-Honokohau National Historical Park for our aquatic geochemistry activity. No trip to Hawaii is complete without visiting the beach, and this activity satisfied our makai requirement by highlighting the unique groundwater environment observed at the harbor. In coastal areas on Hawaii, the presence of major groundwater aquifer systems results in a connection between the marine and groundwater systems. Depending on the tide level, freshwater is released to coastal environments through a hydrological process called Submarine Groundwater Discharge (SGD), which can be easily measured in Hawaiian fish ponds (loko pu’uone) by temperature and salinity gradients. The harbor was a perfect location to learn about SGD due to the influx of groundwater and presence of the Aiopio Fishtrap. After an overview of the techniques for detecting and quantifying SGD, trainees were cycled through three stations: boat, bench, and beach. At the boat station, samples of ocean water were collected for chemical analysis, and temperature and conductivity measurements were taken with a YSI probe in order to determine the extent of groundwater and seawater mixing. At the bench station, the ocean water samples were analyzed for geochemical tracers (nitrate and phosphate) using HACH kits. 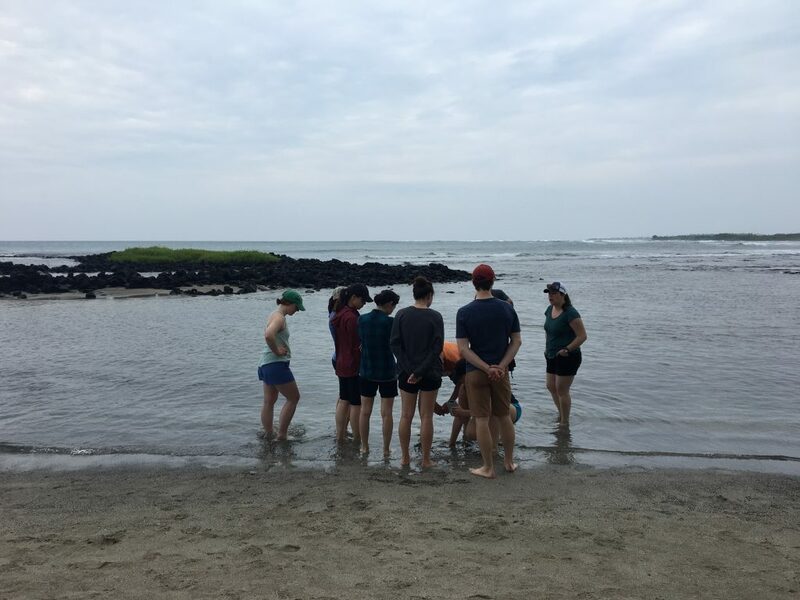 Finally, at the beach station, trainees waded into the shallow waters and used their own feet to identify the significantly cooler influxes of groundwater into the ocean. This was a creative and hands-on (or rather, foots-on) way to learn, made even more special by the presence of green sea turtles sharing the beach with us. After lunch, the University of Ottawa organizing group concluded the activity with a discussion about the implications of SGD fluxes for marine ecosystems, and an overview of a radon and radium isotopic model, the preferred method of estimating groundwater flux. 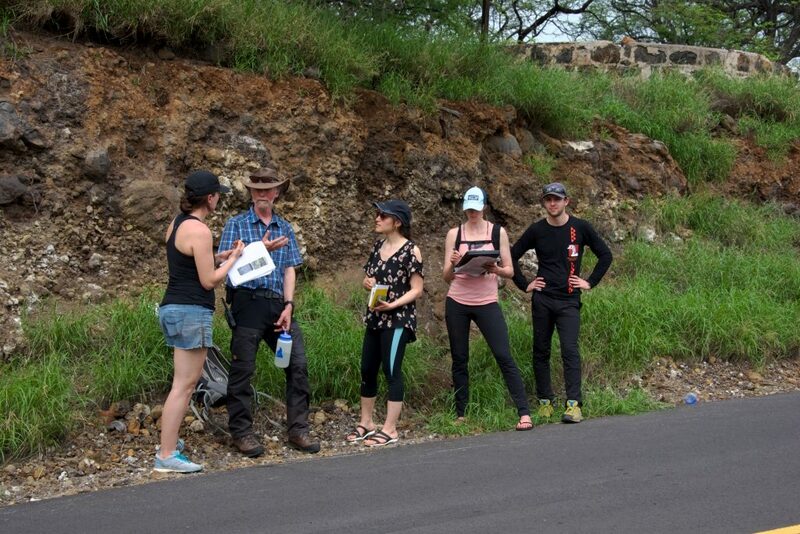 This was followed by the final field exercise, the “provenancing” activity for the geochemistry of Hawaiian lavas group. 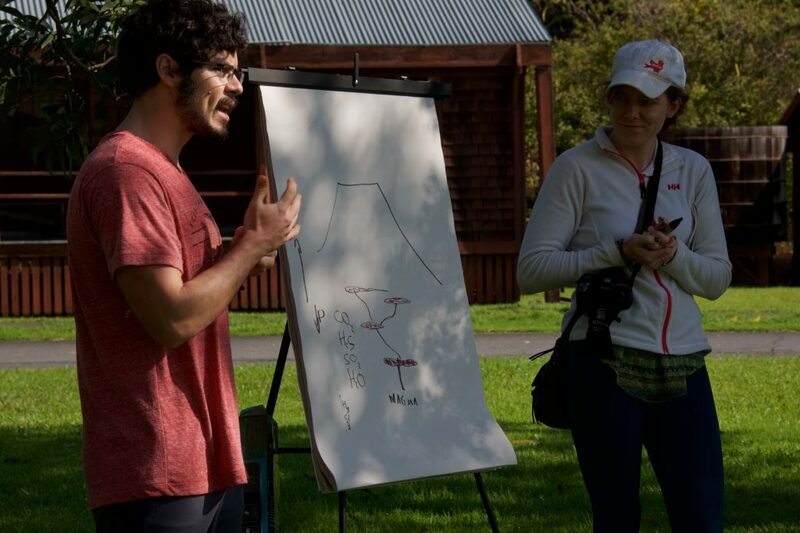 Pairs of trainees were given the trace element data for a rock sample (“tool”) measured at a mystery location during the workshop, which they then plotted on a large group graph. Since the group leaders had been analyzing samples from every stop and lodging location since February 16th, we were able to pinpoint where each of our “tools” had originated. The wrap up discussion utilized the map of Hawaii to demonstrate how we had actually traced our own footsteps all over the island throughout the workshop, just as we try to do with the ancient Polynesians. We ended the educational portion of the workshop with a review of MAGNET’s five previous workshops, and a group brainstorming session about how to sustain the network past its official end date on March 31st. To cap off a successful workshop, all participants enjoyed a wrap-up dinner at the Kona Brewing Company, which included a toast to MAGNET Director, Dominique Weis, to thank her leadership and contributions to MAGNET’s success. The overarching themes of MAGNET are 1. hidden resources, 2. windows into the earth, and 3. fragile ecosystems. Using Hawaii as a model ecosystem, we were able to highlight several established and emerging ways that geochemistry can be used to answer research questions that align with each of these themes. In summary, the workshop was a wonderful way to wrap up the six superb years of MAGNET. We would especially like to thank Drs. Mike Garcia and Frank Trusdell for joining the workshop and sharing their expertise on Hawaiian geochemistry. For more workshop photos from Dominique Weis, see the Flickr album.